My experiments and use of Semolina in baking are on. Having baked breads with semolina, it is now cakes. Semolina gives lovely textures to cakes too. 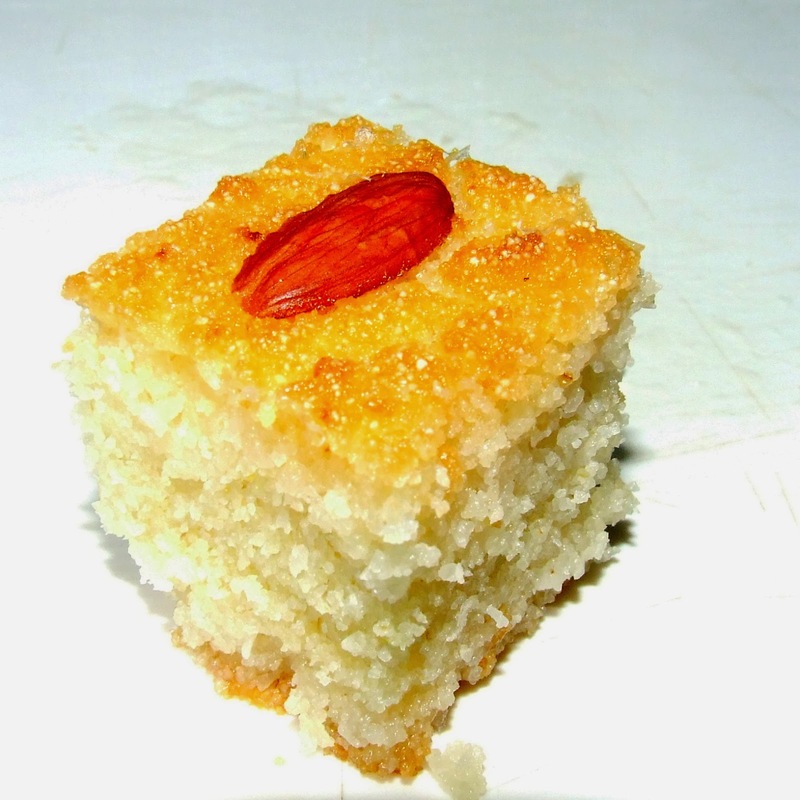 The Semolina coconut cake or Basbousa that was baked last week had a soft crumb and great texture. Drenched in sweet syrup, this cake is very easy to make. This is a very versatile cake. One can try out different combinations. 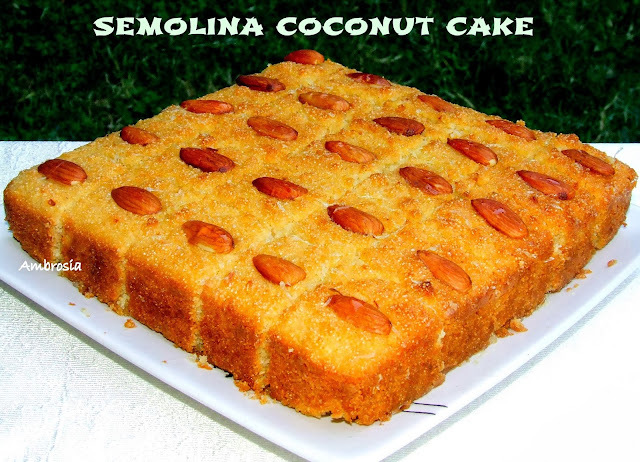 I have baked semolina cake with all the variations and the result has always been great. I have beaked this cake with yogurt instead of milk and olive oil instead of butter. I have also used 2 tablespoons of honey in place of rose water. It is very important to prepare syrup and cool before the cake is ready. Pour cold syrup over hot cake. I read the semolina cake recipes here, here, here and here. Take water, sugar and lemon juice in a thick bottomed pan. Bring it to a boil. Boil for 3 minutes. Turn off the heat and add rose water. Cool it to room temperature. Preheat oven to 190 degrees C. Grease and line a 7 inch x 7 inch rectangular cake pan. Cream butter and sugar. Whisk together semolina and baking powder. Add semolina mix to butter sugar mixture. Add milk and stir. Fold in desiccated coconut. Pour the batter in the prepared pan and level it with a spoon. Let it sit for 10 minutes. Score the batter into 1 inch square with a sharp knife. 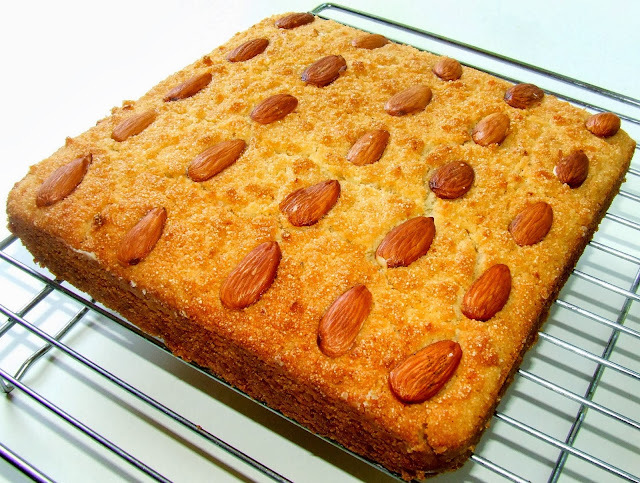 Place one almond half in each square. Bake for 30 minutes or until the top and sides are golden brown. Remove from the oven. Remove from the pan after 10 minutes. Cut the cake along the lines you scored. Pour cold syrup onto the hot cake. Let the cake sit for two hours before serving. Thanks for visiting my blog and trying out the recipes. Adding diced apples is a great idea. Will remember that when I bake it next. Is it sweet enough to make without the syrup? Hello Sk, Syrup makes the cake sweet and soft too. Semolina grains drink water and swell up. This makes the cake juicy. However, without syrup it will be a little dry. Can we make it in microwave? Hello! I have never tried baking in microwave. But I guess you can in convection mode. Hello Navita, I used desiccated coconut. It is dry coconut finely shredded commonly available in the stores. Happy Baking Navita! Hello! I think 7x3 pan would be small. The batter wil not be able to rise well. I would suggest that you go for a bigger pan. 9x5 inch pan would work fine here. Hello, 1 cup is 240ml, in this recipe i have taken two cups semolina. If you want to halve the ingredients, then use 1 cup semolina(240 ml cup) and 1 tsp baking powder. Rest of the ingredients can be halved too. Its a fantastic recipe, tried and everyone loved it!!!! Hi Minal, I am so happy that you visited my blog, tried my recipe and liked it. Hope you try many more. HAs Anyone tried to make this vegan? Please tell how it came out or how to do it! I am dying for a slice now! HI Namita. Great recipe. Can you please give substitutions for sugar in the sugar syrup and in the cake> Can we use jaggery or dates or honey? Hello Priya, Jaggery would be great to add in the batter. For syrup, honey diluted with water and rose water would work fine. Happy Baking! Hi, Baking it in the oven now, used olive oil and yoghurt. Any idea how long will it keep in fridge? Hello Binu, with syrup, the cake will be moist. It should be kept in the fridge for 2-3 days. I baked it in pressure cooker.. and I even added 1 tablespoon of baking soda to the batter.. I had missed to set aside the batter for 10mins but still the outcome was good.. as I had no rose water I used rose essence and it enhanced the flavour..